When we escorted Mohammed and his dad to the airport today, it felt like a big victory for everyone. And as the other families and volunteers waved their tissues to say good bye, everyone was clapping and yelling full of joy! 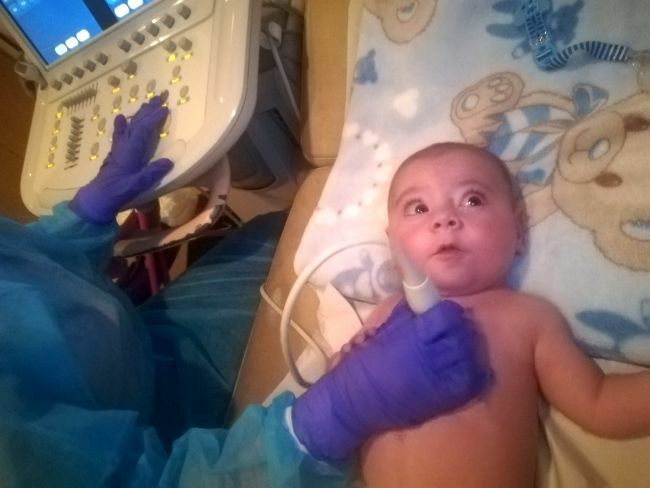 Six months earlier, one-day-old Mohammed received the diagnose he would maximal live for three more days. But his dad did not stop fighting for opportunities to keep his son alive. One month later, Mohammed arrived at the airport, escorted by an Iraqi cardiologist and rushed in the hospital per ambulance. Five long months of worrying, praying, loosing hope and gaining hope again followed. But then after three open-heart surgeries and seven catheterizations, it started to look better for him. On his last echo, his cardiologist said, that his healing is miraculous. Thank you, for all your prayers! You can really see the strength and power of them and of our all mighty God in Mohammed’s life. Mohammed will return for another surgery planned in about 1-2 years time. Up to now, we are simply thankful and so happy for his mother to hold him again. She has been waiting for that moment to happen since Mohammed turned ten days. So praise God! It is not often I hear doctors refer to a child’s recovery as being “miraculous” but for Mohammed I have heard this said multiple times. As the doctor shared this again today she also commented that following the first lengthy catheterisation Mohammed underwent she had some inspiration about how the outcome could be improved in a second procedure. Praise God for His faithfulness. 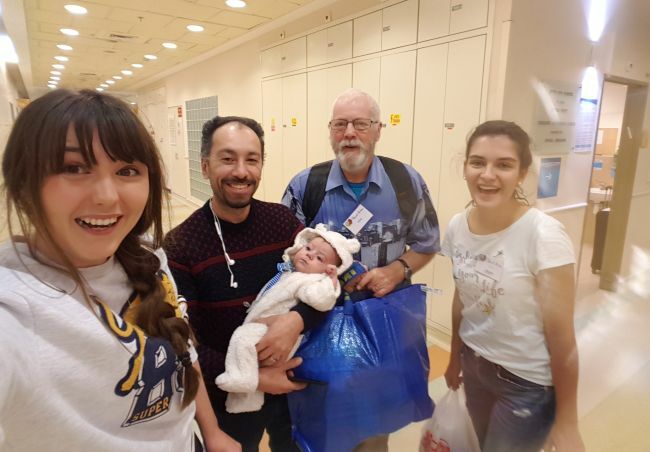 So many times we pray for divine inspiration for the medical team working with our Shevet children and it is just wonderful to see how He does this in such a powerful way that we see miracles before our eyes! 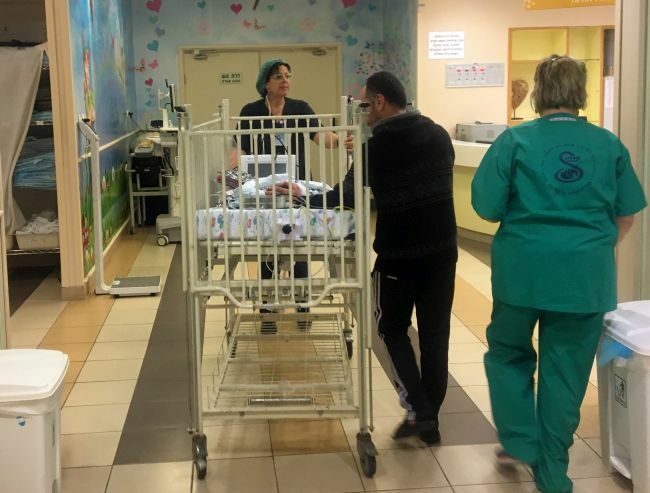 Please continue to pray for all of the doctors and nurses working with our Shevet Community. Please pray that we as a community can bless them and show the love of God to them as we work with them daily. Mohammed attended his final echo at Sheba hospital today. His devoted father stayed by his side, armed with milk and a nursery rhyme video on his phone for when the situation became a little overwhelming. The echo looked really good and the doctor shared that Mohammed could return home to his mother, who hasn’t seen Mohammed or held him since he was 10 days old. I think initially it took a bit of time for dad to realise that this was actually for real and then a smile spread across his face that would go nowhere! 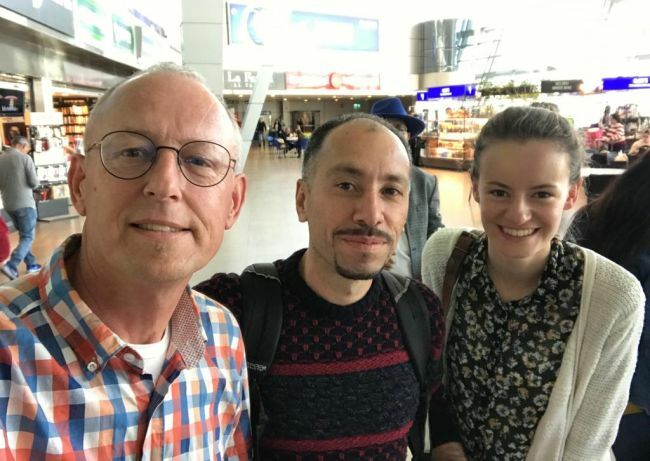 Mohammed has been in Israel for over 5 months. 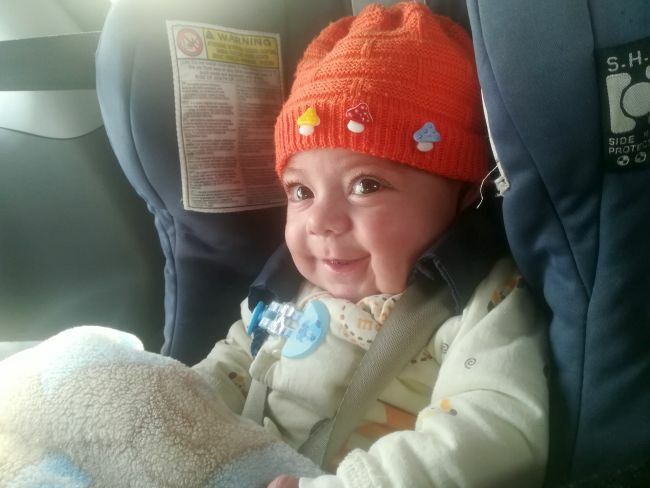 He is such a beautiful baby who needs very little excuse to smile. His journey up until this point here has been so challenging. 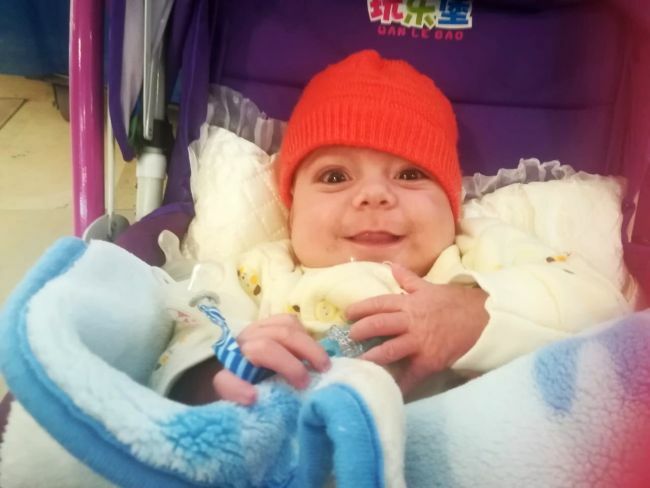 Mohammed’s father was initially told to just take him home to his family where his life expectancy was under one week. However, his father has remained totally committed to ensuring he can rest knowing he has done everything he can for his son. How much more our Heavenly Father has done and is doing for us. 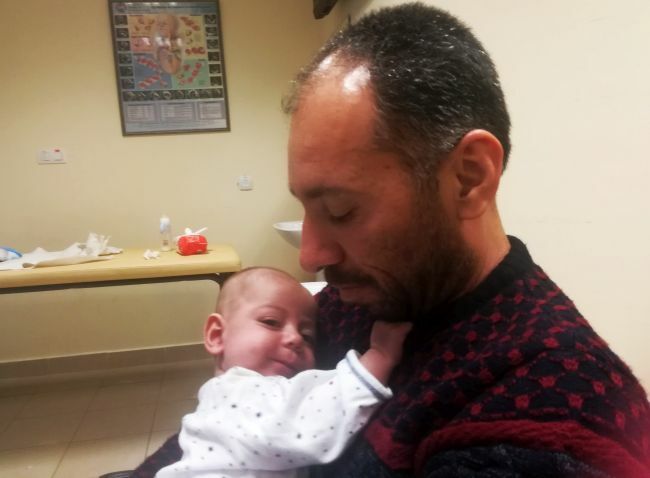 Mohammed will leave Israel this week but may return in around 2 years time for a further surgery. We thank God so much for bringing hope to the hopeless, for gifting this boy with inner joy and for making a way for Mohammed. 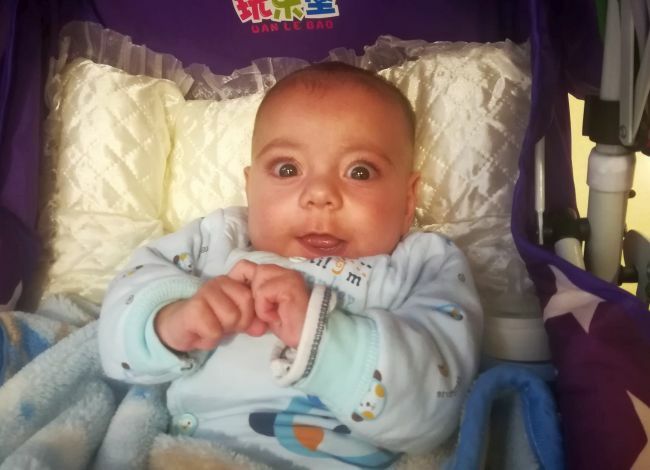 When the hospital called us and said that Mohamed and Lazo were ready to go our house I was very happy that Lazo’s recovery from his surgery was so fast and also because Mohammed is almost ready to go back to Kurdistan to see his amazing mother and brother and sister. I was only thankful to God for his mercy and faithfulness with us and with this beautiful families. When I arrived to the hospital, Mohammed and his dad were discharged with medication and papers ready, they were only waiting for us! 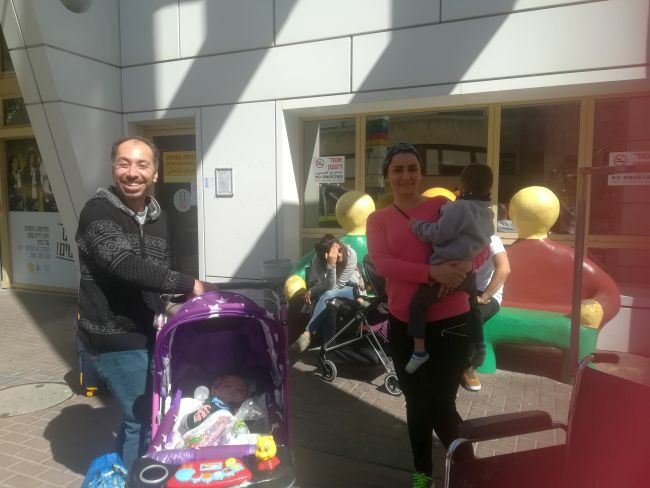 For me it was a pleasure to pick them up and see the happiness in Mohammed’s dad’s face! While waiting for the car I said to his dad: “God loves you so much.” He only smiled and said that finally they are going to go home! Maybe next week Mohammed is going to have his last echo in Sheba hospital. Please pray that everything continues well and Mohamed and his amazing dad can go home next week! 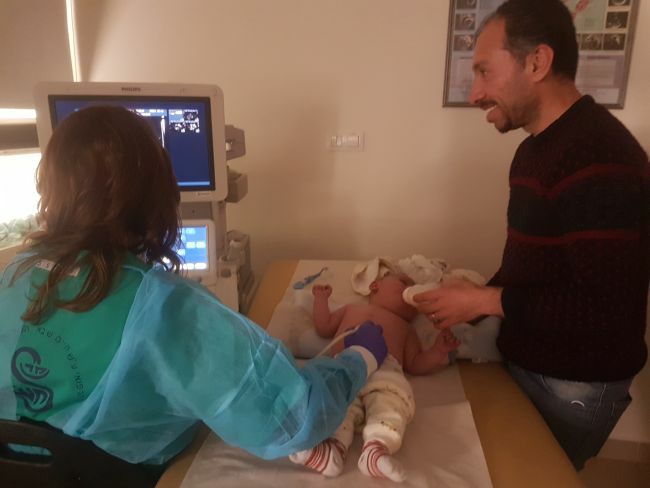 Today Mohammed had a cath as hopefully one final procedure before he can go home to Kurdistan. When I came to Mohammed he was about to have his cath, the nurses were taking him with them. I waited with Mohammed’s dad. 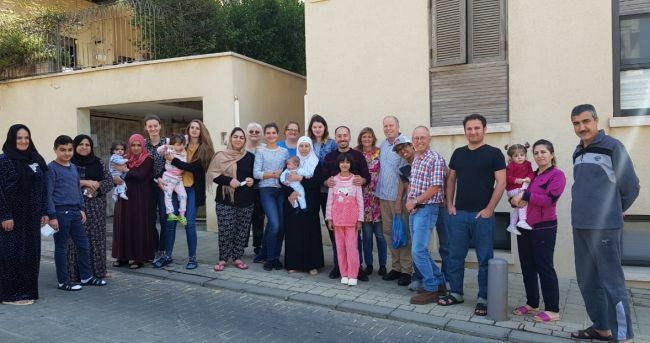 First we went outside to have coffee and after that we visited Noora and Bella and later Hani and her dad as well. It was good for him to be distracted while waiting for the end of the cath. Also Mohammed’s dad was cheerful today and in a good mood. The cath went well and Mohammed’s dad is happy and hoping for a good recovery. Please pray for little Mohammed that he can recover well and hopefully go home soon. Today Mohammed got an echocardiogram, chest x-ray, and a brain MRI. He did so well during his echo, then took a nap while waiting for his MRI. During this process, I was able to be with Mohammed and his dad during the echo and while waiting afterwards. This was extremely special for me because I have gotten echos done my whole life. To be able to be on the other side and know what was going on helped me to better understand what this family is walking through. Watching his dad interact with him was so sweet. It was evident how much he cares for and loves his son. 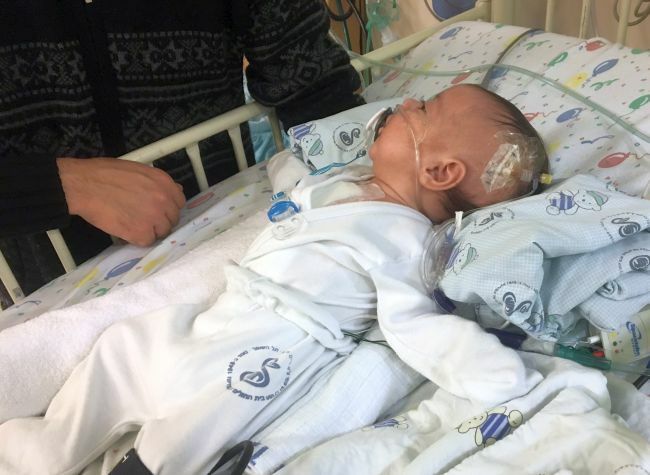 After the echo, Mohammed’s dad was talking to me about the last few months here in Israel. He explained how difficult it was to watch his son go in to surgery so many times. My heart broke for the fear in his heart that is rooted in his deep love of his son. This experience was a beautiful picture to me of the love and care that God has for his children. Mohammed will have a catheterisation tomorrow. Please pray for his healing. Mohammed’s whole life is testament to the glorious works of the Father. Today very early in the morning we took our smiling Mohammed and his amazing father for a long day at the hospital. In the beginning he had an echo, ECG, vital signs. 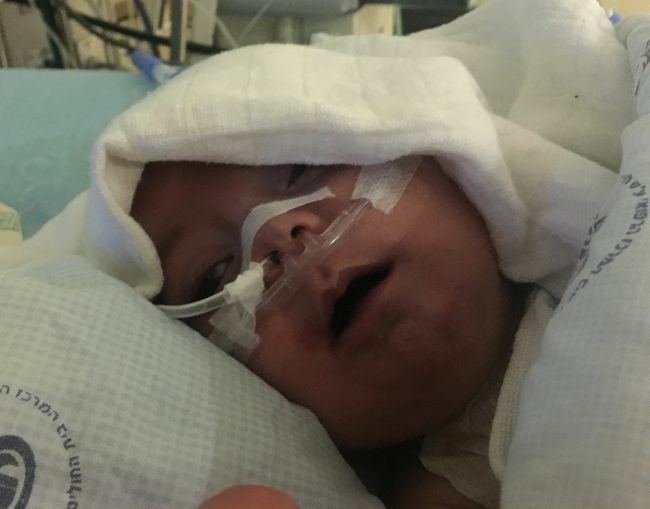 During the echo he didn’t cry very much – he is such a brave little boy. The doctor was happy with his progress but she has not made a decision when he can go home. 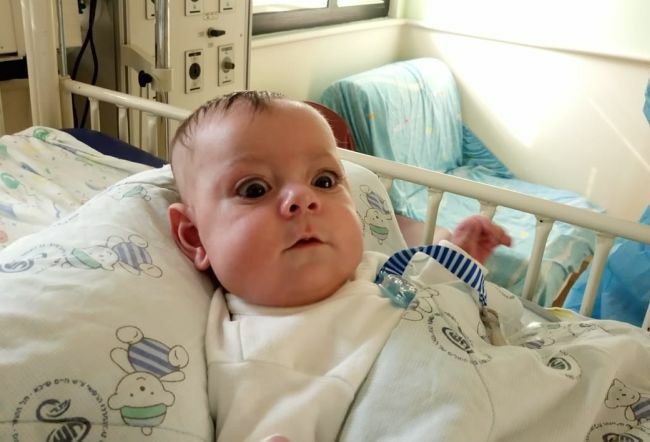 Maybe in a few months Mohammed will have another cath procedure so the doctor will decide if he should stay here or go home and than come back. They will decide soon. Praise the Lord! Mohammed looks so much better and is getting stronger. His father is so happy to see his positive progress. Tomorrow he is going to have a venous ultrasound on this lower limbs. After waiting a long time he got his RSV vaccination for this winter. Please pray for wisdom for the medical team for the best medical plan for our brave Mohammed and for the decision about when he can go home to see his loving mother. 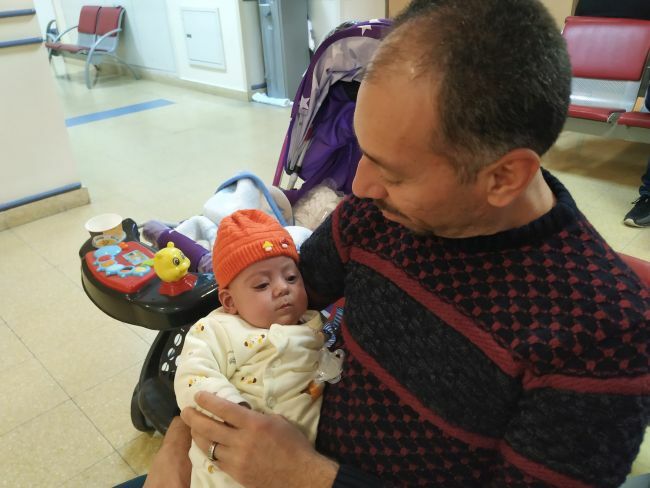 After being one week in our Shevet apartment, Mohammed had his first visit back to the hospital today. 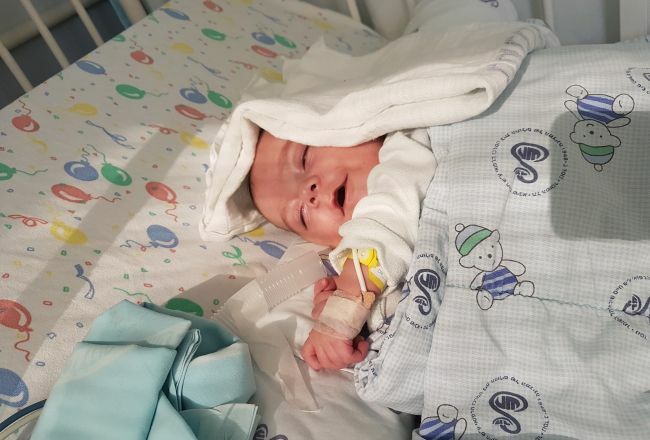 It was an appointment with the neurologist because Mohammed had an intensive time when he was hospitalized and was at risk for brain damage due to a long intubation. The neurologist checked him and noticed a decrease in strength and development. Tomorrow he will have an EEG and we made an appointment for a brain MRI. Mohammed is a lovely boy. He smiles and is drinking well but at times he also seems to be tense over his whole body. The doctor also recommended physiotherapy which can be given by one of our volunteers. We hope and pray that the other test will show no brain damage and that Mohammed will fully recover. 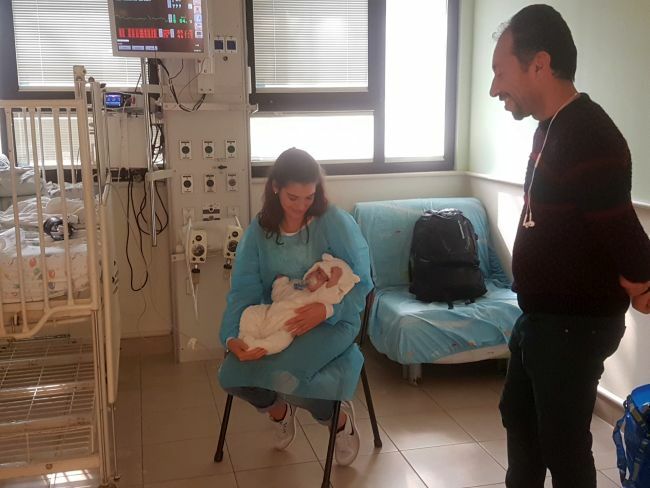 For baby Mohammed and his father today was somewhat momentous. For the first time since the age of one week, Mohammed now 4 and half months has experienced life outside of the hospital walls. The nursing staff at Sheba were so celebratory with Mohammed and his father as we left today and there was so much joy in the air. Dad himself looked like a different person, light and happy. As we walked to the car Mohammed experienced the sunshine hitting his face for the first time, he was dazzled and frankly to begin with a little alarmed. His eyes were so wide as we entered different spaces such as the lifts and the shopping area soaking each new experience in. The car was parked on the 14th level of the carpark which offers a great view of Tel-Aviv. Mohammed’s dad said to me “Now I can see, in hospital you just can’t see anything”. It was so touching after such a long period of adversary to have this moment of perspective. Mohammed’s life and future really lies in the hands of our heavenly Father now for He is so much bigger and broader than our current circumstance. Please pray for the Father’s hope to be planted into Mohammed and His Father. Pray for the supernatural healing and maintenance of life for Mohammed. We are so thrilled to have these 2 back with us at our Shevet home. 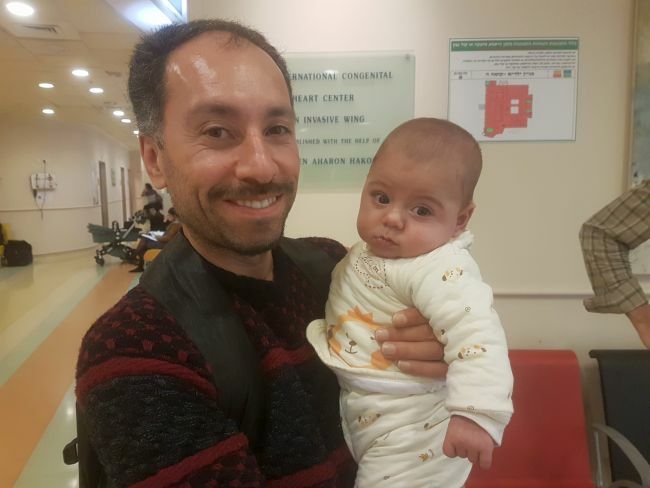 Today when we arrived at the hospital, Mohammed just left for his catheterization. Usually a cath procedure takes two to three hours but today they took all the time to open up his vein to the lungs. 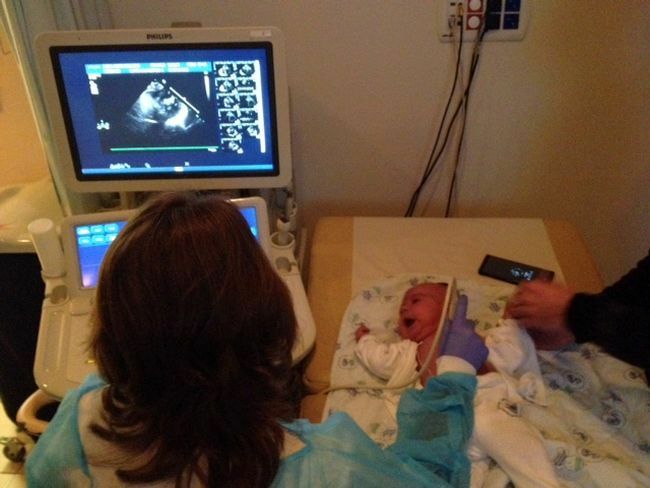 The doctor explained to the father that it would be a difficult job because a part of his heart is not fully developed. Father was at peace and pleased to know they were careful and he trusted the doctor. Father has lived many years in the Netherlands and speaks Dutch better than English. He loves to speak Dutch so we had lots of time to catch up on many things. He is very committed to his son and is very helpful to translate for the Kurdish families. When I entered the room, Mohammed’s Dad hold his little baby in his arms to get the Baby to sleep. Mohammed’s Dad was in a good mood today. After some good time spending with them in their room, we went to 1st floor to have an chest x-ray to see if the water is still in his lungs. Before we left Mohammed had an echo as well. The results of both we hopefully will get the next days. It was very good to see Mohammed and his dad in a better shape. Also the Dad said that the doctor is now thinking about Mohammed’s next catherization which he maybe will have soon. Beside that Mohammed’s dad mentioned that Mohammed’s bacteria is perhaps gone or just not active anymore. Please continue to pray for Mohammed, that he gets stronger every day and that his dad will keep his good mood. “Mr. Miracle,” as I call Mohammed, had an echo today. His doctor says he is doing very well. One of the ventricles is not the size she would like it to be, but she thinks he maybe can go back to Shevet next Sunday. She needs to talk to the board and decide. 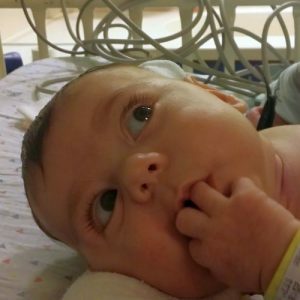 His oxygen level is getting better – when he is in his dad’s arms, the percentage goes up. Please pray that his body accepts the milk so he can gain some weight. We are waiting for you at home, Mr. Mohammed Miracle. Mohammed’s dad had a sad countenance as he looked into his son’s face and softly rubbed his hand. “They’re going to operate again,” he said, “This is the third time.” “What would you like us to pray for?” He shrugged. “They won’t know what to do until they see what’s going on inside him. They may do one thing and he’ll need another operation in 2 months, or they’ll do the other thing and he’ll need an operation in 2 years.” After an emotionally bruising 6 hours of waiting the surgeon appeared. He announced Mohammed had become unstable during surgery and it had taken some time to stabilise him. They placed a Sano shunt from the right ventrical to the pulmonary artery. If this is accepted and Mohammed heals well his next procedure to upgrade the shunt will be in a couple of years. Mohammed’s chest remains open for now. Please pray that Mohammed’s body deals well with the changes and he goes from strength to strength. The good news today, is that we finally know why they have not been able to wean Mohammed off the supplemental oxygen. In today’s exploratory cath, they discovered massive blood clots in his pulmonary artery. They now have him on powerful anticoagulants. If the medications can dissolve the clots, he may not need any more surgeries. However, if the blood clots do not go away, Mohammed will need another large, complicated surgery. So right now, we pray into his life that God would finally end this long marathon of hospital stays and bring health into his body. 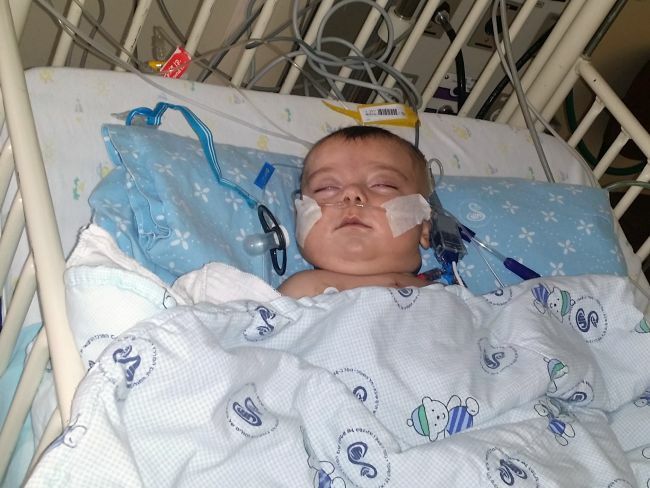 As of right now, Mohammed Z still needs $6000 toward surgery and related expenses.